This Gaming Agreement (AKA: Account Terms and Conditions) sets forth the terms and conditions that will apply upon using twoupcasino.com. By playing at Two-up Online Casino, you would need to understand and comply with these Terms & Conditions. Followed are the Two-up Online Casino Terms & Conditions. Please take your time and read them thoroughly to assure that you fully understand the conditions and are ready to abide by them. Terms and conditions associated with promotions and / or offers are subject to possible changes. It is a player’s responsibility to consult and /or check with the website for any alterations or updates that are associated with them. By using any service, software, or the Two-up Site you are obligated to abide to these Rules in their entirety and without any reservations, including, but not limited to making deposits through our Service or submitting your deposit details for further processing. “Two-up Online Casino” Refers to the brand Two-up and all of the products and services listed under it, all of which are offered “Online” and are accessed via PC or any mobiles device supported. “We/Us/Our” refers to Two-up Online Casino and its managing company, along with any of its holding and associated companies (where context permits). All Players at Two-up Online Casino must be of legal age (18+). Players from the following countries are not eligible to open a Two-up account and are not allowed to make a deposit: ISRAEL, POLAND, INDIA, HUNGARY, MALAYSIA, RUSSIAN FEDERATION, UKRAINE, BELARUS and COSTA RICA. Any bets placed from any of these jurisdictions will be voided. Any bets and/or deposits made by any resident of these countries will be refunded. Players from AZERBAIJAN are not eligible to use any free chips supplied by Two-up Online Casino. It is highly recommended that you understand all the rules and steps involved with online gambling, through the use of Two-ups Online Casino. Players must accept that participation in Two-up Online Casino is under their own discretion and risk. Moreover, Players may only use Two-up Online Casino as entertainment and for a nonprofessional uses. A player’s Username and Password is personal & confidential information. It is a player’s responsibility to assure that this information will be kept in a private manner and it is forbidden to share that information with a third party. Two-up Online Casino is not required to keep player’s login information or passwords in case player misplaces, loses or forgets it. The website, known as www.twoupcasino.com will be used by a player solely for his own private online gambling uses. Utilizing it for any other players or uses is strictly prohibited. Players will be barred from using any abusive strategies. Two-up reserves the right the check your logs and transactions and to cancel any promotion entitlement. Two-up uses random number generator system that determines the results of all the games it provides. A Player should fully comprehend and be aware of the fact that he/she might lose funds by playing at Two-up. Two-up Online Casino reserves the right to limit and / or refuse any wagers placed by a player, or to refuse any game bonus. The Casino reserves the rights to limit and / or deny any wagers placed by a player. Casino also retains the right to deny any game bonus for reasons including, but not confined to, player’s defamation. If abusive behavior is suspected, a player’s account will be terminated, and he/she will be banned from the casino indefinitely. Players are required to only place legitimate details upon registering. By downloading the casino’s software or signing up for any offer(s), player agrees to the receipt of occasional promotional e-mails from us & our affiliated programs. Terms and conditions associated to any promotion / offer are subject to future changes. It is a player’s sole responsibility to regularly check out for modifications and updates. Players are recommended to make a copy of all transactions, game rules, withdrawal regulations and all casino updates in order to avoid any possible future misunderstandings or possible disputes. It is required to comprehend and comply with all of the above rules before using Two-up Software. Players that will not comply with all the Rules under Player Security & Description, will be in breach of this agreement and therefore barred indefinitely. Any player that will knowingly not comply with these sections may be committing fraud and thus could be subject to criminal prosecution. The maximum withdrawal amount (unless otherwise stated) from a No Deposit bonus in an amount valued at or below $50 is twice the face value of the bonus. All No Deposit Bonuses valued above $50 come with a cash-out limit equal to the value of the bonus. No Deposit Bonuses cannot have max cash-out of over $100. Please note that some offers may include a max cash-out condition equal to 3 times the bonus amount, which is to be stated in Terms and Conditions of a particular bonus. Players are not allowed to claim more than one free bonus at a time. If a player attempts to claim more than one bonus consequently, the winnings will be voided. Each No Deposit bonus entails different restrictions, depending on the respective promotion. Player is advised to read bonus restrictions before using it. Inappropriate bonus use may result in your winnings being forfeited. No deposit bonuses cannot be used to play progressive games. If a player uses a no deposit bonuses in a progressive games it would nullify all of his winnings. Mixing deposits and Free Chips is not allowed, yet Two-up Online Casino is aware that this might happen. If you make a deposit while using a Free Chip, wagering requirements and the maximum allowed to cash out of the mentioned bonus will still apply. Please make sure to contact the Customer Support Department for a further possible application of the correct bonus if you notice such a thing happens. Claiming any promotional bonus other than a deposit bonus requires a player’s account balance to be at $1 or less. If a player plays any game that is not indicated on the coupon as a part of its promotion, winnings will be voided. Free chips cannot be used with progressive games. Using Free Chips with progressive games would nullify all winnings and transactions. Two-up Online Casino reserves the right to lock or terminate any player’s account, if that player is found abusing the free chip promotions offered by the casino. The player is not allowed to mix or combine promotions and / or bonuses, unless stated otherwise. If player combines bonuses, her/his casino winnings may be rendered void on withdrawal. Please be sure to use only one bonus at a time. Unless otherwise stated by Two-up Online Casino, player cannot claim any Free Chips if there is a pending withdrawal attempt in place or if the player has an existing balance. Weekly CashBack is calculated on all deposits made over the previous 7 days, with the minimum of $100 to qualify. CashBack bonuses must be wagered a minimum of 30 times for slot games (Particularly, video slots, 3-reel slots, keno, bingo, and scratch cards) or a minimum of 35 for card games (Video poker, Blackjack, Blackjack multi-hand, Tri-Card Poker, Three Card Rummy, and Texas Hold’em Bonus Poker). Bets placed on excluded games will void all earned casino winnings. As already stated above, Two-up Online Casino allows only one active account per person, family, household address, email address and / or credit card number. Unless otherwise stated; All promotional funds (bonus amount) stay in the house upon completing the wagering. Bonus money serves to enhance play and helps to generate winnings and thus, cannot be withdrawn as part of the winnings. All promotional funds will be deducted from your winnings by Two-up, and will not be returned to the account upon withdrawal. Upon withdrawing your winnings, the bonus amount will be removed from the total winnings amount. As specified earlier, promotions cannot be used in conjunction with other promotional offers. Promotional offers are only available to players whom the offer was issued for directly, by either the Two-up casino, or their agent. Promotional offers that were sent via email, phone or mail are intended for the recipient only and cannot be transferred. If a player uses bonuses to accumulate a feature guarantee within a game, or additional bonus rounds in slot games, and funds an account or uses extra bonus to reach the bonus rounds, any earnings from such rounds / features would be considered as void. Two-up Online Casino reserves the right to void bonuses, if promotional abuse is suspected. If a player uses a promotional offer her/she is not entitled to use, all of the winnings generated from that promotion will be voided and the original deposit will be returned to the player. Suspected fraudulent bonus claims or withdrawals may result in a player`s account being suspended, or terminated. The redeeming of a coupon is deemed as acceptance of the terms and conditions associated with the coupon’s promotional offer. Players are not required to use coupons when depositing and are not advised to do so without a reviewing and understanding of these terms and conditions. Two-up Online Casino reserves the right to make changes to these Terms and Conditions at any time without notifying the player. It is under the player’s responsibility to review the Terms and Conditions page on a regular basis and to check for any amendments or any additional rules added. If a player is unclear or unsure regarding any point relating to a specific promotion, it is under the player’s sole responsibility to contact the Customer Support Department for more details regarding the promotion, before accepting it. Any promotion or offer can be terminated or altered at any time in accordance with the decision of Two-up Online Casino, and without notice or obligation. Two-up reserves the right to disqualify specific countries or individual players from using promotional offers. Professional players or players that are suspected to be abusing the bonus system in any way, may have their bonuses revoked and be subject to further sanctions, at the discretion of the Two-up Online Casino management. Promotional offers & Bonuses cannot be used on Progressive Slot games, unless otherwise stated. This terms and conditions apply from the time a bonus is redeemed until a Player has completed all his wagering requirement and has a balance of less than $1. Any winnings gained by playing Progressive Games in combination with using promotional offers will be annulled upon requesting a withdrawal due to the violation of the promotional offer rules and playing an excluded game. Passwords to Restricted Slot Tournaments will be provided to the selected players by Two-up representatives through mail, phone or live chat only. If a player gains entry to a Restricted Tournaments by a source that is not a Two-up representative, the Players entry would be considered invalid one to the mentioned Tournament and would consequently disqualify the player from gaining any winnings generated by playing during the Tournament. Players that use passwords that are not sent through the proper communication channel by a Two-up Online Casino, might have their accounts suspended indefinitely due to fraudulent uses of the casino’s services. 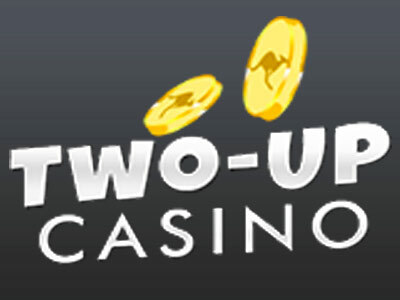 Two-up Online Casino makes no representations or warranties, implicit or explicit, as to the player’s legal right to participate in any of its games, nor do any of its employees, licensees, distributors, wholesalers, affiliates, subsidiaries, advertising, promotion or other agencies, media partners, agents or retailers have the authority to make any such representations or warranties. Two-up employees, licensees, distributors, affiliates, wholesalers, subsidiaries, advertising, promotion or any other agencies, media partners, retailers and members of their immediate families are not eligible to participate in casino games. A player is only allowed to enter the Casino for his own personal entertainment uses and as non-professional use. Any other forms of usage on the gaming platform website are strictly prohibited. If evidence suggests that a Player has more than one active account at Two-up Online Casino. If a Player provides incorrect or false information during his registration process. Any mismatch or discrepancy between the name on the Player’s Casino account and the name on the credit card(s) the player used to make a deposit into the account. If a player participated in a Casino bonus program and requests a withdrawal without fulfilling the requirements of that particular promotion. If a player resides in a jurisdiction where participation in the casino is prohibited, as stated on Two-up Terms and Conditions. If a player permitted someone else to play using his Two-up Online Casino account, whether it was done intentionally or unintentionally. If a player is suspected game on uses that are not for personal entertainment only, or for his personal use only. If such case is suspected, Two-up Online Casino reserves to prevent player’s account from using any promotion. Moreover, Two-up may additionally void all player’s winning, and refund him for his deposit. If a player is found cheating or if Two-up Online Casino determined that a player made use of a system that was designed to defeat the casino (This includes machines, computers, software or any other automated system). Wagers must be placed only through Two-up user interface. Any wagering through other means, including the use of a “robot” player is strictly forbidden. If a player is found using any additional software that was not supplied by a casino, Two-up Online Casino reserves to right to cancel and void all of his/her wagers retroactively and to suspend his/her her account and / or take any additional actions. If a player has been suspected to be a bonus abuser; playing a low or no risk strategies only to cash out promotional money. If it has become known to the company that a player has played under any of the circumstances listed under this section, in other online casino(s). If a player charged back or reversed any of the deposits made in the casino or in the other Two-up sister casinos operated by the platform. As Two-up encourages responsible gambling, Players may request to be excluded from our software or to set a deposit limit at any time. Your privacy is extremely important to us. All Players can decide to unsubscribe from any form of marketing communications, including email, text messages or phone calls at any time. Please note that all transactional messages related to your account will still be received, as they are considered as account information and are not a part of our marketing communication. Two-up Online Casino does not have any control over any associated third party marketing communications, including but not limited to, affiliate campaigns, promotional or marking agencies, etc. If a player feels he has been victimized by spam activities, resulting from a third party advertising and / or a promotional campaign published by Casino facilities, we strongly recommend contacting Customer Support at Two-up. Two-up Online Casino will make everything in its power to address to the corresponding third party affiliate company and have player’s details taken out from their database to stop any additional possible marketing communications. Two-up Online Casino cannot guarantee any definitive solution and resolution in regards to any third party complains. Two-up would not be held accountable and / or liable for any possible errors in the Terms and Conditions advised by a third party marketing agency or website. Two-up Online Casino reserves the right to add new activities or games to the Casino and / or to discontinue any activity or game offered by the casino at any time, under its sole discretion and without any notice to the player. Two-up will not be held accountable or liable for any possible computer or Internet malfunctions nor will it not be held accountable for any Player’s side attempt to play games provided by the casino using strategies, methods or means that are not approved by the Casino. Any earnings that were generated as a result of either system malfunction or game error will be voided. In the event a game is interrupted or disconnects at any time, the game will be resumed from the point before it was disconnected. Result from the previous game should be displayed once the player starts the game again. If the player gets disconnected from the Casino’s server mid-game, the player will be able to continue and complete that game exactly as if he/she had never left. If Two-up server does not receive information on the player’s bet and is therefore unable to process it, the player’s balance will not get deducted and the player would be able to see the result of his last wager. The maximum win from any single spin is at a multiple of 50,000 times your bet per line, unless stated otherwise. This consists of any free spins or other features that may be associated with a single spin. If the player has any dispute he wishes to file in regard to the outcome of a particular game, he/she must submit a complaint to Two-ups in writing within 10 days. Two-up Support representatives will make sure to check the game report and advise accordingly regarding the outcome of the game. In an event a discrepancy between the result showing on the player’s Casino software and the Casino’s server software is found, the result shown on the Casino’s server software will be determine the conclusive and definite result of the Game. Any applicable taxes on any winnings that such player collects from Two-up Online Casino, are under the player sole responsibility. If a player is found cheating or attempting to defraud the Game in any way, or if the player is found making false and/or malicious comments with regard to Two-up Online Casino, the casino reserves the right to advertise those actions along with the player’s identity and e-mail address, in addition to transferring player’s information to other casinos, banks, credit card companies, and to the appropriate agencies. From 25.05.2018 Two-Up Online Casino will enforce the General Data Protection Regulation (hereinafter – the GDPR), the new European legislation meant to replace the 1995 Data Protection Directive. The GDPR which can be read in full on the CNIL website is the new Europe-wide law governing the use and handling of individuals’ personal data. If a player attempts to use a payment method which he is not the account holder of, Two-up reserves the right to treat any deposit into the account as being invalid and any winnings generated from that specific deposit as void. By depositing into a player’s Casino account, a player consents to not to making any charge-backs, reversals or cancel any deposits from his/her her Player’s Account, and to refund and compensate the casino for any unpaid deposits in addition to expenses incurred by us in the process of collecting the player’s deposit in case one of one of the above events takes effect. Player’s Account will not be used by the player as a bank account and should Two-up find that the player deposits into that account and withdrawals from it without making any bets or gaming activity, Two-up reserves the right to deduct an account administration charge, whether or not we decide to terminate or suspend the account. Withdrawal requests must be reviewed and approved by the Two-up Online Casino finance department before being sent out as for payments. Upon making a withdrawal request a player will be required to send in valid identification documentation confirming player’s age and address. Withdrawal will only be processed for payment when Two-up Online Casino has received all requested identification documents. Color photo of the front and back sides of the credit card used for making deposits at Two-up Online Casino. The Company requires only first 6 and last 4 digits, the expiration date, the card holder’s name on the front and the signature on the back. The rest can be covered. Copy of a voided personal check. The voided check may be perforated with a “Void” stamp, or crossed out, or have “Void” written across it. Withdrawal payment will only be made to a Registered Customer. The player hereby authorizes Two-up Online Casino and its designated agents to confirm his/her identity whenever it may be required, and to clarify the player’s right to use the money that he/she has wagered at Two-up Online Casino. The Casino may withhold funds in player’s account until the player’s age is successfully verified. If the age verification process is not successful and a player is found to be underage, Two-up Online Casino will return all deposits made to the player, voiding all winnings and/or bonuses generated by the casino. Two-up Online Casino reserves the right to process any withdrawals from Casino accounts preferably using the method(s) used by the player to fund his account, whenever possible. If withdrawal process is delayed, Two-up will look for the best available method in order to process the withdrawal successfully. Documentation approval is a one-time procedure that can take up to 4 business days. If the casino finds any document to be missing, it will send an email to a player with an updated list of necessary documents needed to be provided to the Casino finance department for the verification process. If a player does not comply or fails to provide the proper documents within the time frame mentioned above, the Two-up Online Casino might deny any withdrawal request until such documentation is supplied. Once the documents are approved by the casino’s finance department, a player may request a withdrawal. It usually takes up to 3-7 business days for Two-up finance department to process a withdrawal for a client. All Withdrawals will stay in the player’s Two-up account until all the relevant security checks have been successfully made. Two-up Online Casino allows a maximum payout of up to $2000 per week. VIP players, enjoy a higher maximum weekly payout. For more information, please consult to your VIP Account Manager. Two-up Online Casino does not charge the player any fees for any of his withdrawal methods, however, the player’s payment processor or bank may levy a processing fee to the withdrawal which the player is responsible for. Due to a third party processing policies and/or limitation weekly or monthly withdrawal amounts may vary. Please consult the table above for more information. Two-up Online Casino reserves the right to send out the player’s winnings in installments. Installment amount is calculated in accordance to the player’s class. Player class is generally determined by depositing or the gaming activity of the player. A portion of balance that has been removed is represented by a “Manager Withdrawal”, that portion was removed since it was not eligible for withdrawal. A Manager Withdrawal amount could either exist due to Bonus funds, which are non-cashable, or if the player exceeds the Maximum Withdrawal Amount on his/her last bonus, with excess funds removed. If evidences suggest that a Player has more than one active account at Two-up. Any mismatch or discrepancy between the name on the Player’s Casino account and the name on the credit card(s) a player used to make a deposit into the account. If the casino finds that the same payment method is being used by more than one person (e.g. – Two players using the same Credit card). If a player purposely “charged back” or reversed any of the deposits made in the casino or in the other Two-up sister casinos operated by the platform. If a player is found cheating or if Two-up Online Casino determined that a player made use of a system that was designed to defeat the casino (This includes machines, computers, software or any other automated system). Two-up Online Casino reserves the right to void any winnings that were generated as a result of a hardware/software error, malfunction or human error. In the event of any of such malfunctions or errors all wagers will be voided. Upon multiple withdrawal requests, Two-up Online Casino reserves the right to combine the total amount of withdrawals requested, into as few requests as possible to allow faster payments, and up to the allowed maximum amount to be paid per week. A player may contact the Two-up Online Casino Customer Support Department 24/7 via toll-free AU number: +61 1 800 920 187 or by sending an email to our support team at: support@twoupcasino.com. Please note: All Customer Support calls are recorded for quality and security purposes. Please make sure to add support@twoupcasino.com and verification@twoupcasino.com to your safe list group so you would be able to receive any important account information or exclusive offers for your account.